Ferrymen and watermen could once be seen piloting surprisingly big and heavily-laden craft across crowded harbours with a single oar worked over the transom, but these days it’s much less common. 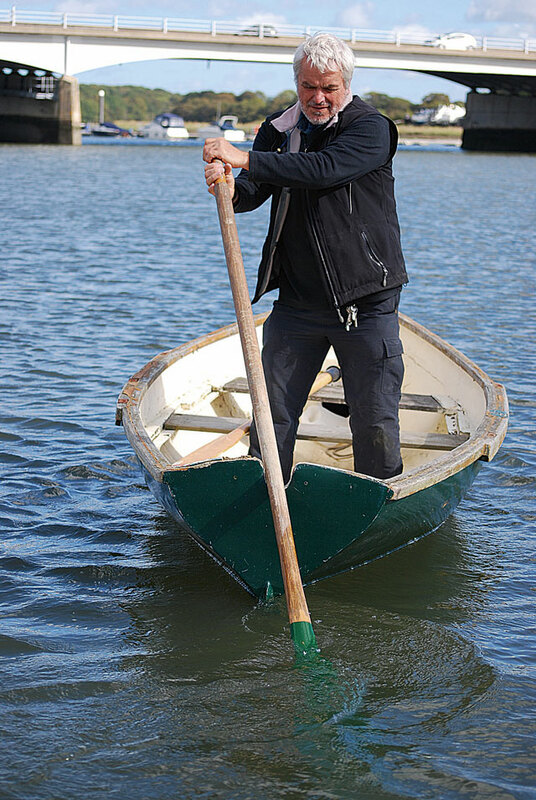 You’ll still see sculling over the stern in use around our coasts, however, if you look in the right places. 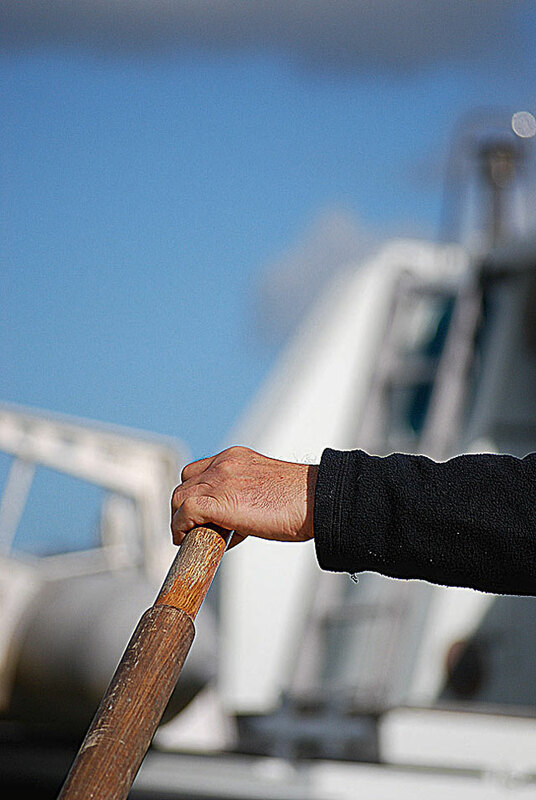 Fishermen can sometimes be seen sculling noiselessly out to their trawlers on early mornings, and Sea Scouts, old gaffer sailors and traditional village regattas do their best to keep the skill alive. Single oar sculling is the art of propelling a boat with an oar over the stern. If you grew up reading Swallows and Amazons, you may remember Arthur Ransome’s evocative description: ‘In the stern of Swallow there was a half-circle cut out of the transom, like a small bite out of a slice of bread and butter. ‘There was room for an oar to lie loosely in it, so that the boat could be moved along by one oar worked from side to side, and this way and that, so that it always pushes against the water. The sculler, holding the oar with both hands, makes a figure-of-eight motion with his hands and arms and at the same time, by twisting the oar, causes the oar’s blade to emulate the motion of a fish tail or a ship’s propeller. A skilled sculler can make a boat travel very fast and move large loads. It’s a skill that most yachtsmen can master with a little practice, and can come in really useful. I learned to scull some years ago, but have never managed to master standing up and using both hands well enough to make it effortless. Time to talk to an expert. 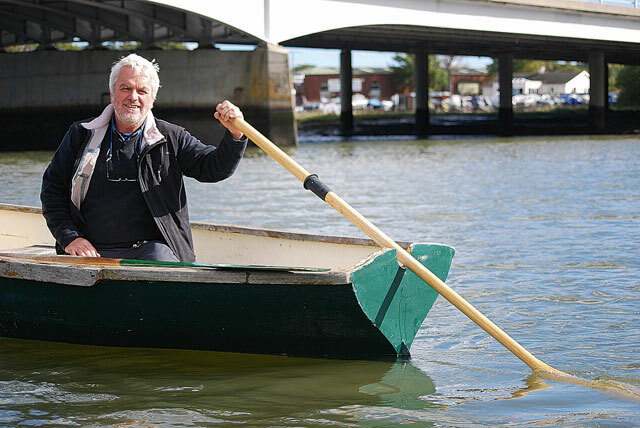 Glyn Foulkes, lifelong resident of the River Hamble and well-known local chandler, is the local sculling champion, having learned at an early age and won every sculling race at the annual Swanwick, Bursledon and Warsash Regatta since the early 1970s. Glyn could recently be seen at the regatta’s water carnival sculling a lighter with a half-sized London bus atop it! Why bother learning to scull? After all, what’s wrong with rowing with a pair of oars? Well, sometimes it’s simply not possible to row in the conventional manner. 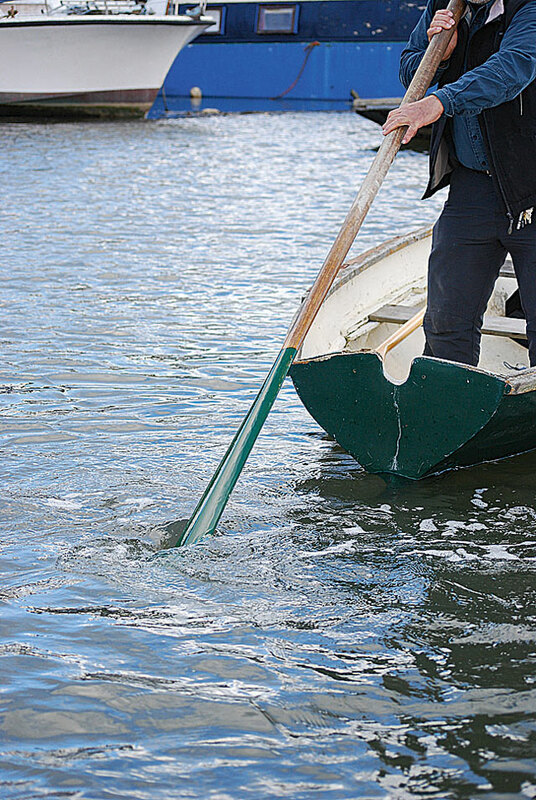 Sculling is a useful way of moving a loaded dinghy that’s too laden for you to use both oars. In a sailing dinghy it means you can make headway even if the boom is too low or furled sails prevent rowing. 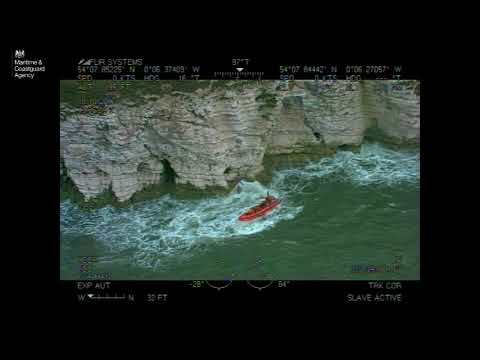 It’s handy for making headway up a channel that’s too narrow for a pair of oars, between moored boats, or in busy harbours where standing up and looking over your shoulder allows you to see where you’re going. 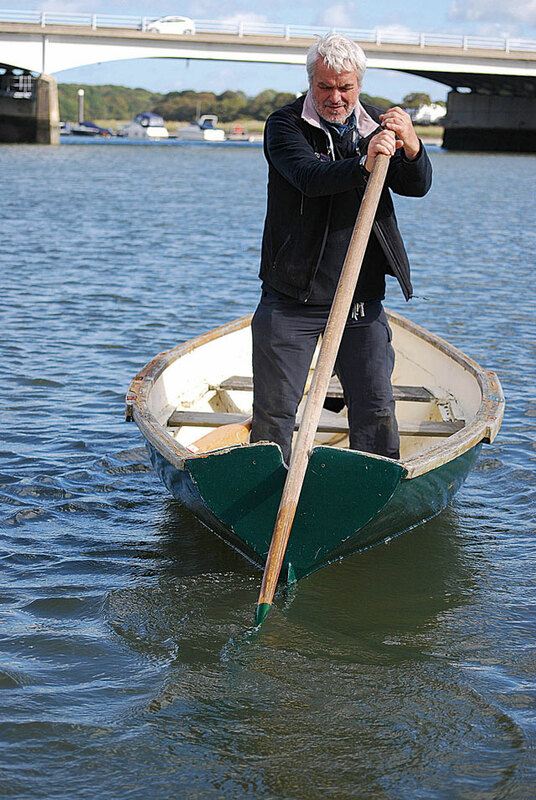 It’s a useful ‘get you home’ skill in case you break an oar. And you can use the same technique to propel big boats too: all you need is a long enough oar, commonly known as a sweep. Try sculling and you’ll soon find that once mastered, it’s a traditional skill that is immensely satisfying. The aim is to move the oar through the water in a figure-of-eight movement. You’ll need a sculling notch, or a rowlock fitted to the transom. 1. Start by placing the oar in the water with the blade vertical. 2. 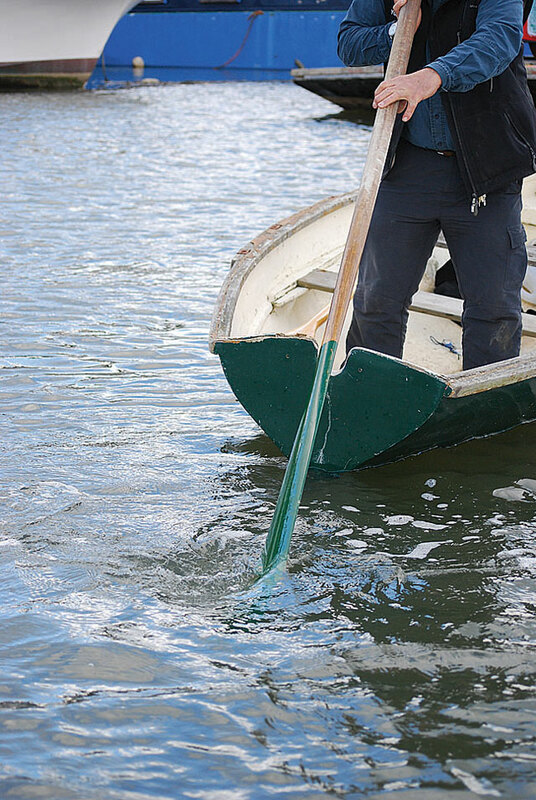 Move the oar to one side and twist your wrist so that the blade ends up at around 60° to the vertical. 3. 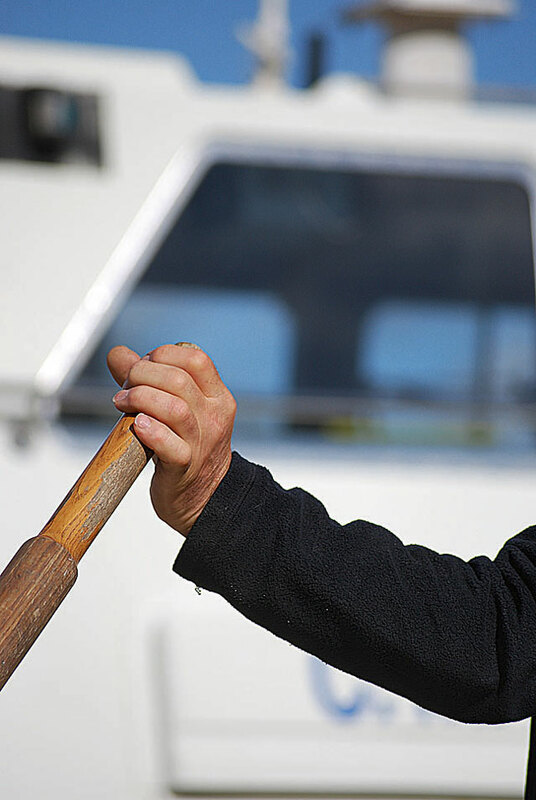 Now move the oar across the boat, rotating your wrist so that the blade is twisted 60° to the other side. Repeat back and forth in a figure-of-eight movement. To gain extra speed, give the blade a positive ‘flick’ at the end of each stroke to complete the twist: this gets maximum thrust from the blade. You should find that the movement of the oar, scything through the water, provides enough of a downward force to keep it in the notch. It’s best to use two hands when sculling standing up. 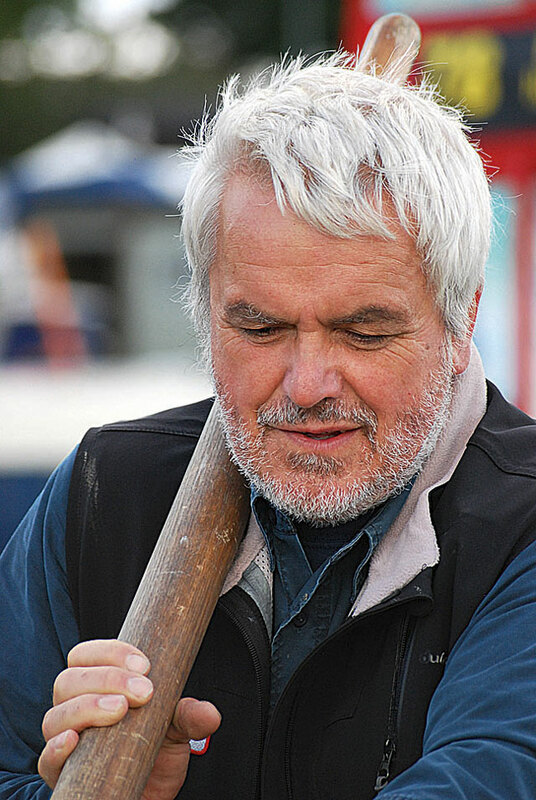 ‘Although you’ll keep both hands on the oar, don’t use both arms all the time,’ advises Glyn. ‘Instead, use one arm in turn to push the oar across the boat, to share the workload between your two arms’. When sitting you might find it easier to use just one hand. 1 With the oar blade at an angle of roughly 60° and your hand on top of the oar, pull towards you. 2 At the end of the stroke give the oar a slight flick with the wrist to twist it the other way. 3 With your hand now underneath the oar, push it back on the opposite stroke. To scull standing up you’ll need a longer oar than you’d normally use for rowing. 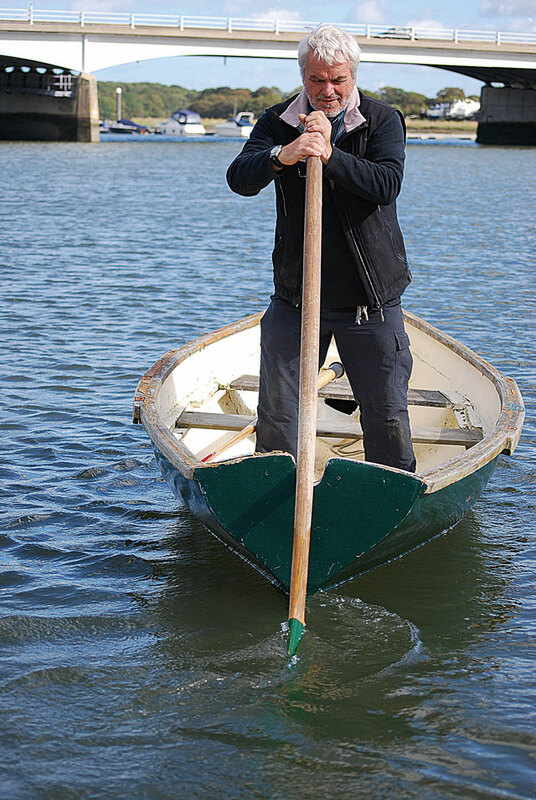 Ideally, you want the oar to reach shoulder height when the blade is submerged. Most dedicated sculling oars are flexible and long, with a thin and lengthy blade which allows the oar to twist and turn with minimum effort. 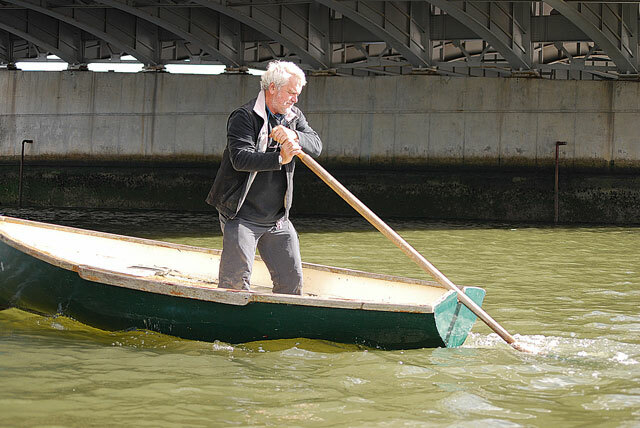 Most rigid dinghies should be suitable boats for single-oar sculling: the bigger the boat, the more likely it is you’ll be able to stand up – and the longer the oar needed. If you master the technique but find the oar jumps out of the notch, or you’re struggling to make headway, it could be that your oar is too short. Many people scull sitting down, either because their boat is not stable enough to stand, or because they’re more comfortable sitting. But as long as your boat allows it and you have a long enough oar, it’s much more efficient to stand up. Another advantage of sculling standing up is that you can use your feet to keep the boat level. As you use each hand in turn, gently shift your weight on to the opposite foot. 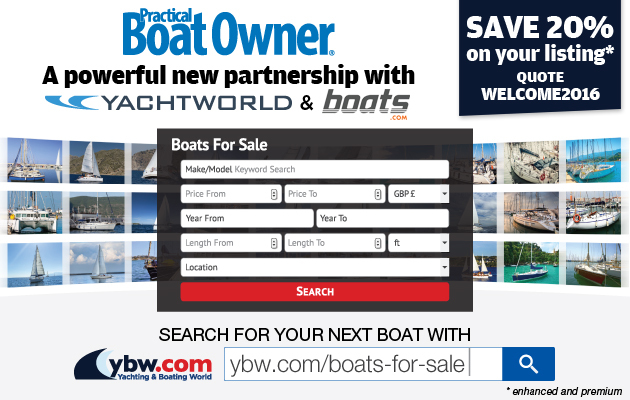 It might take some practice but you’ll soon be able to keep the boat on an even keel, which is much more efficient, wasting much less energy than if the boat is rolling around. But ultimately it’s down to the stability of the dinghy and the length of the oar whether or not you feel comfortable standing up. Some people find it easier to scull one-handed, and If you’re struggling to scull with both while sitting down, learn the movement with one and add the second hand once you’ve got the hang of it. Altering course while under way is easy – you simply work the blade to one side, with a shorter lateral movement, until the bow is pointing the right way. 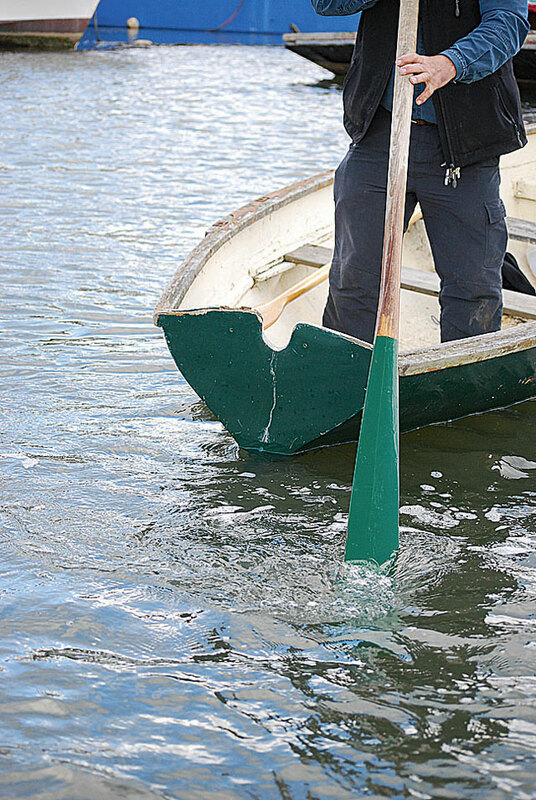 To make bigger course alterations, you just need to ‘row’ the stern around until the bow is pointing the right way. An everyday use of sculling is when coming alongside in an inflatable dinghy. This works especially well with flat-bottomed, traditional Avon-style dinghies, which you can simply scull sideways using the normal rowlocks. 1 The notch in the boat’s transom won’t be used here. Instead use your neck and shoulder to support and pivot the oar’s handle. 2 With the blade at 45° to the transom, work the oar from side to side, ‘pulling’ the water towards you. 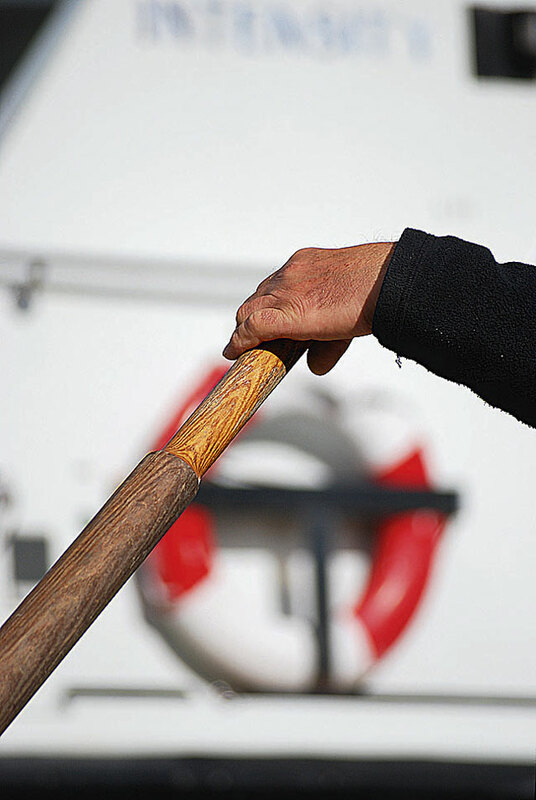 3 At the end of each stroke, rotate the oar so that the blade faces the other direction.